Intelligent, gentle, affectionate and even tempered. Small, rose-shaped of fine texture. Shoulders oblique, well set back, muscular without being loaded, narrow and cleanly defined at top. Forelegs, long and straight, bone of good substance and quality. Elbows free and well set under shoulders. Pasterns moderate length, slightly sprung. Elbows, pasterns and toes inclining neither in nor out. Chest deep and capacious, providing adequate heart room. Ribs deep, well sprung and carried well back. Flanks well cut up. Back rather long, broad and square. Loin powerful, slightly arched. Thighs and second thighs, wide and muscular, showing great propelling power. Stifles well bent. Hocks well let down, inclining neither in nor out. 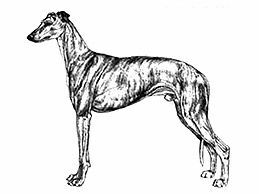 Body and hindquarters, features of ample proportions and well coupled, enabling adequate ground to be covered when standing. Moderate length, with compact, well-knuckled toes and strong pads.